The kitchen is one of the most important rooms in your home. It’s the place your family gathers and eats. Most of the action in your house seems to happen in the kitchen. It’s essential, then, that it looks and functions well. Are you thinking about installing granite countertops? 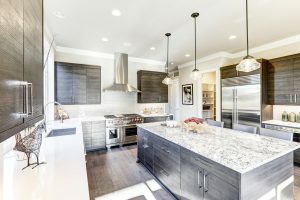 Below are a three frequently asked questions and answers to help you get going on getting your kitchen in tip-top shape. Granite is stone, and if you’re looking for something that is durable, heat resistant and long-lasting, nothing compares to it. Once you have these countertops in your kitchen, you will never have to replace them. They are low-maintenance and come in a variety of colors, types and finishes. With so many options, there’s bound to be at least one you love. Granite is an easy material to care for. It does need to be sealed once a year to keep moisture out. If moisture gets in, it may begin to seep into the stone and stain it. The first time the granite countertops are sealed is when they’re installed. You can call upon a professional to seal them every year after. Other than this, daily maintenance involves keeping the countertops free of debris and spills. Your best place to start is by contacting a professional who can help you choose the right product for your needs. With so many options and variations available, a professional is your best resource for providing information and answers to all your questions. Granite countertops can improve your kitchen in many ways. They also help increase the value of your home since this is one element many prospective home buyers look for. Choosing granite as the material for your kitchen gives you a long-lasting and elegant product.